Four of the top five sides face one another this Saturday as Stourbridge travel to Sedgley Park and Hinckley host Tynedale whilst league leaders Sale FC will just be concentrating on getting their job done at home to Otley as the drama unfolds below them. At the wrong end of the table this week, two teams currently in the bottom three clash when Sheffield visit Blaydon as both sides go in search of another victory in their quest for safety. Elsewhere, sixth placed Huddersfield entertain Chester and South Leicester take on Macclesfield whilst an in-form Wharfedale go to Leicester Lions and Sheffield Tigers welcome Luctonians to Dore Moor. It has been a significant few weeks in Sale FC’s season. Victories over fellow promotion candidates Hinckley and Tynedale saw them move into pole position in the title race and despite not being in action last Saturday due to their postponed fixture against Macclesfield, Jonathan Keep’s side stayed at the summit of this division. The only side that could have knocked Sale off their perch were Hinckley, but their surprise defeat at Sheffield means the Manchester-based side are still firmly in control of their own destiny. Their lead was cut to two points following Stourbridge’s victory over Leicester Lions, but Sale are holding all the cards at the moment. With a couple of games in hand and on a 14 match winning run, the table toppers are nicely placed so their visitors on Saturday will know how tough this challenge will be. Having said all of this, Otley arrive at Heywood Road having lost just three of their last nine fixtures which has lifted them away from the relegation battle. Peter Clegg’s side should be in a positive mood as they look to become the first club to inflict a home league defeat on Sale for 14 months. Since the middle of December, Stourbridge have been pretty much faultless. After a blip in form which looked to have derailed their promotion hopes, Neil Mitchell’s side have provided an empathic response. Seven wins from their last eight matches has catapulted them back into the fight for a place in National One and last weekend’s triumph over Leicester Lions saw Stour move into the top two positions. 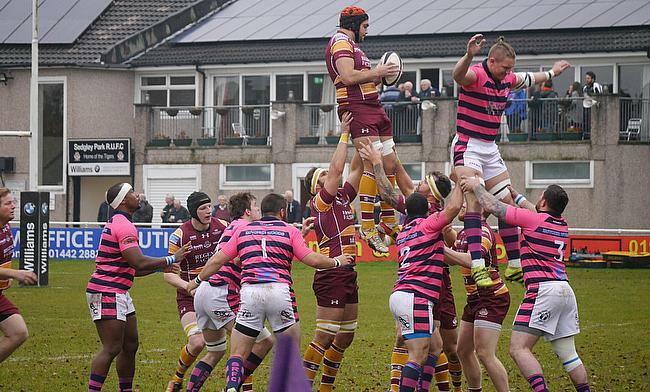 On the club’s website, they have described this upcoming fixture with Sedgley Park and their clash with Tynedale next week as “vital” with both of their opponents also in the promotion mix. Sedge welcome Stour to Park Lane with the hosts sitting fourth in the table and four points off their visitors, but Matt Bebbington’s side are still very well placed. The Tigers’ have a game in hand over Stourbridge and they can move into the top two with a bonus-point win on Saturday. You wouldn’t put it past Sedge either, as they have won nine of their last 11 games and have a 100 per cent record at home this term. Our second helping of action in this potentially crucial weekend for the promotion race comes from Leicester Road as Hinckley host Tynedale. Director of Rugby George Chuter admitted the hosts have made it more difficult for themselves to clinch a top two spot following their defeat to Sheffield in Round 22. The loss in Yorkshire last weekend meant the Hornets slipped out of the top two places and with all their rivals possessing games in hand, Hinckley know a victory over Tynedale is a must if they are to keep their promotion dreams alive. The home side are only a point behind second placed Stourbridge, but they are still yet to win on their own turf in 2018 so Tynedale will be keen to capitalise on that statistic when they visit the Midlands on Saturday. Scott Lawson told us this week that his side don’t have ‘a grand plan’ in terms of their ambitions for this season, but their win over South Leicester last weekend has kept them in the promotion hunt. With two games in hand, Tyne are seven points off second place and with a crucial fixture with Stourbridge to come next week, the fifth placed side will be eager to clinch their first away victory for just over two months to stay in the race for a top two finish. Last weekend’s 43-5 defeat for Huddersfield against Wharfedale was arguably their worst result of the campaign. Gareth Lewis’ side came off second best at the Avenue as Dale condemned the men from Lockwood Park to their fourth loss from their last five matches. 2018 has been tough so far for Field, but when you look at the bigger picture, the Yorkshire outfit have to be pleased. Currently, they sit sixth in the table following promotion from National Three last term and a seventh home win of the campaign this weekend would boost morale once again. Chester arrive in Yorkshire having secured yet another home victory. Only Sale FC and Tynedale have won more games on their own patch than Chester this season and their triumph over Blaydon was their ninth success at Hare Lane. It was also the first time the Cheshire club have secured back to back wins since October and it leaves them firmly in mid-table with eight games in their season remaining. The reason why Chester have not been able to challenge higher up the division is because of their away form and they will be looking to improve on just two wins from 11 outings this Saturday. You cannot argue with the fact that South Leicester have struggled since the turn year, but their performance at Tynedale last weekend highlights the quality the Midlands club has in its ranks. After just one in five matches prior to their trip to the North East, South showed character to earn a bonus-point against the promotion candidates which Richie Williams and his coaching staff will be hoping can reignite their season. South currently lie in seventh place, but they will have to improve on their recent form if they are to finish in the top half for the second year in succession. In this weeks blog we have an interview with the Blues Head Coach, Marshall Gadd https://t.co/Ye6ml3QqKj ? In fact, South have won on just one occasion over the last two months so Macclesfield may fancy their chances of claiming a result at Welford Road this Saturday. Macc will be feeling revitalised after their fixture with Sale FC was called off last weekend and Marshall Gadd’s side will also be itching it bounce back after their loss to Sheffield Tigers last time out. Despite this, the Blues have won four of their last six matches which leaves them eight points clear of the drop zone and with three games in hand, their fate is still very much in their own hands. Can the Cheshire side continue to move away from the relegation battle? It has been a 2018 to forget so far for Leicester Lions. A change at the top has seen Andy Key return to TMDP Park and he will be aiming to turn the Lions’ indifferent season around as soon as possible. The Midlands club are currently on a run of one win from their last six matches which has seen them slip out of the top half of the division. The Lions’ last win came against Otley three weeks ago, but they have not tasted victory on their own patch since they beat Sheffield Tigers in the middle of December so that will be something they will want to put right this Saturday when they host Wharfedale. However, the visitors’ form couldn’t be more different ahead of this encounter as Dale arrive in the Midlands having won five of their last six matches. That run of results has lifted James Doherty’s side off the bottom of the division and now the Yorkshire outfit sit six points clear of danger. Coach Hedley Verity told the Craven Herald that Wharfedale’s slow start to the campaign was down to the side not having a good enough pre-season, but he’ll be hoping the back end of this term is completely different as Dale bid for safety. Sheffield Tigers would have been disappointed that they were unable to build on their victory over Macclesfield last weekend. The Tigers began brightly in their Yorkshire derby against Otley, but the hosts battled back to clinch the win to condemn Jamie Broadley’s side to their 10th defeat in their last 11 matches. The 10th placed side now have the chance to bounce back and secure successive home wins this weekend when they host relegation threatened Luctonians. This week, Luctonians’ Twitter feed made for some interesting reading. The club put out a tweet asking for current and former professional players to send some words of encouragement to Ryan Watkins’ side as they currently sit 15th in the table and nine points from safety. One of the replies came from Ireland great Brian O’Driscoll which read “The end is nigh? You won’t suffer much longer?” The Lucts will be hoping that BOD is not correct on this occasion and their situation is not fatal just yet. Luctonians do have three games in hand, but to take advantage of those potential season defining matches, they much start picking up victories and after a positive performance in defeat against Sedgley Park last week, the Lucts will be hoping to go one better at Dore Moor this Saturday. It was the standout result of the weekend in National Two North last Saturday. Sheffield’s battling victory over high-flying Hinckley has once again given the Yorkshire side belief that they can escape relegation and avoid an immediate return to National Three. As thing stand, the men from Abbeydale Road are just six points adrift of safety and five wins from their last 10 games as rejuvenated their season. This weekend, they have a real opportunity to take that next step towards moving out of the relegation places when they travel to bottom of the table Blaydon. It has been a really tough year for the North East side following relegation from National One and a combination of different factors has led to them staring at the possibility of playing National Three rugby next season. The Crows are nine points from safety with a couple of games in hand, but they have a great chance on Saturday to stop the rot of seven straight defeats and potentially spark a revival.